I’ve finally scored a copy of Pokémon Sapphire, thus marking the start of my exploration of the third generation of Game Freak’s iconic RPG series. While Emerald was my preferred Hoenn title, I found that locating a legitimate copy of any of the generation III titles online was something of an annoying endeavor, and luckily one of the vendors at Youmacon had copies of both Ruby and Sapphire for reasonable prices. Ultimately, the version exclusives for Sapphire won the day, and as of right now I’ve clocked approximately one hour in. The pacing for this journal will likely be slower than the journals I kept for Pokémon Y and Platinum earlier this year, simply because there are other video games that I am ranking as higher priorities than Sapphire. Also, I’ve played a ton of JRPGs this year, and while they are plenty of fun and offer a generally extensive amount of content, I feel like a break from the genre is in order. I still intend to post my review for Sapphire before the end of 2013, and in all likelihood, it will be posted before the end of November. But expect reviews of Resident Evil: The Mercenaries 3D, Killer is Dead, and possibly even Pikmin 3 to be posted before then. My starter was Treecko, though in truth, my starter Pokémon is largely irrelevant to this particular playthrough. I’ve already used all three Hoenn starters between my Platinum playthrough and Soul Silver replays. There are other Grass type Pokémon that I have my eyes on that I ultimately intend to use in lieu of Treecko, including Shroomish and Lotad. 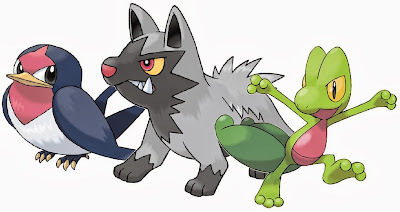 Unlike my past few Pokémon playthroughs, I do not have a core team of six ironed out from the get-go, though I certainly have ideas in mind, and plan to stick to my pattern of not reusing Pokémon from previous playthroughs (thus why Treecko will ultimately be boxed). Obviously a single hour worth of gameplay hasn’t revealed to me much about the nature of Sapphire, but I am impressed with what little I’ve seen thus far. The game world looks surprisingly more visually impressive than I expected, and the fact that the introductory sequence was breezed through in a matter of minutes was a welcome manner of kicking things off. I guess I thought that the running shoes were a generation IV item, but those too proved a convenient bonus right from the start. As of now, my team is made up of the aforementioned starter, Poochyena, and Taillow, but I know there are Shroomish looming in the grass nearby, and a Grass/Fighting dual type evolution (Breloom) sounds like a cool addition to my roster.